Testing Arduino's board usually implies a breadboard to setup up the sensors/actuators and connect them to the board. Having this two pieces apart sometimes cause accidents and makes moving your tests out of your laboratory difficult. 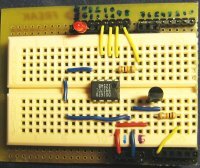 Following the tutorial of the Breadboard Shield Design you will find that making your on breadboard shield is easy and you will experience how useful it is in your next tests circuits. The only thing it lacks is that it doesn't forwards the reset button to the shield, so you will need a pen or something to hit the reset button on the Arduino board each time you want to program it. I found the two pins I need to forward from the Arduino board to the shield to be able to set another reset button on it, so I will bear this in mind for my next shield.